What’s better than getting two in one? Nothing we can think of. 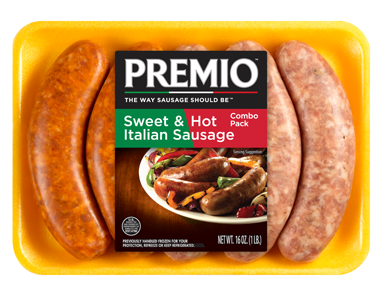 That’s why we put two of our most famous Italian sausages in one convenient package — the Premio Hot/Sweet Combo Pack. Now you don’t have to choose between hot and sweet because you can have them both in one. Satisfy the heat lovers and the sweet lovers at your table by using our tasty, convenient hot/sweet combo pack to make an unforgettable meal today. Ingredients: SWEET ITALIAN SAUSAGE INGREDIENTS: Pork, Less than 2% of the following: Water, Sugar, Salt, Spices (including fennel & black pepper), Potassium Chloride, Paprika, Natural Flavors. HOT ITALIAN SAUSAGE INGREDIENTS: Pork, Less than 2% of the following: Sugar, Water, Salt, Paprika, Spices (including red pepper & fennel), Potassium Chloride, Natural Flavors, Extractives of Paprika. Heat a pan to medium temperature. Add 3 tablespoons water and place links in pan. Cover the pan, continue heating for 10-12 minutes, turning the links often. Remove cover and continue cooking for 5-10 minutes or until golden brown. Serve and enjoy! Having trouble deciding if they’re a hot or sweet kind of person? Now you don’t have to with our fresh hot/sweet combo pack, guaranteed to satisfy. Make a delicious “Land and Sea Bar-B-Q” or “Sausage Con Faggioli e Escarole” with Premio Hot Italian Sausage. A Four Cheese Tortellini comes alive with the delectable taste of Premio Sweet Italian Sausage, as does Creamy Sausage, Mushroom and White Bean Soup. Go on — let your taste buds decide which flavor wins! What’s the Difference Between Hot, Sweet and Mild Italian Sausage? You already know that Italian sausage — both hot and sweet, not to mention mild — tastes great. All three are packed with tons of Italian pork flavor. But what sets them apart? It’s all about the spice mix. What makes Premio Italian sausage special is its mix of Italian spices. It’s that special blend of herbs that makes Italian sausage unlike any other meat. So how do you tell them apart? Start with your basic mild Italian sausage. The primary spice you’ll find here is fennel. This gives the sausage a distinct, delicious flavor that’s appealing to a wide variety of palates. For sweet sausage, we add some fresh sweet basil. Some people believe sweet Italian sausage tastes the way it does because we add in a lot of extra sugar, but really, it’s mainly that natural sweetness of the basil that brings out all that great sweet Italian sausage flavor. So where does that leave your hot Italian sausage? Here it’s all about the addition of red pepper flakes. That red pepper spice gives our hot Italian sausage an extra kick that some sausage fans just can’t get enough of. Why Choose an Italian Sausage Hot and Sweet Combo? The Premio Hot and Sweet Italian Sausage Combo Pack gives you everything you need for some great Italian sausage meals. A dish like sausage and peppers is perfect with an Italian sausage hot and sweet combo, because you get a great mix of spicy and hot flavors and not too much of each. You get to enjoy all the flavors without any spice overpowering the dish. This can be true for a number of dishes that incorporate Italian sausage. Then, there’s the variety you get in the hot and sweet Italian sausage combo pack. If you’ve got varied tastes, as many of us do, sometimes you’ll be in the mood for the kick of a spicy hot Italian sausage and other times your craving for sweetness will demand the satisfaction of a great sweet Italian sausage. With the Premio Italian sausage hot and sweet combo, you’re ready for either one! Finally, not everyone in your family necessarily has the same favorite taste when it comes to Italian sausage. Perhaps the kids enjoy more of a sweet taste with their sausage while you and your spouse appreciate the spicy hotness a little more. With the Premio Hot and Sweet Italian Sausage Combo Pack, you can satisfy the whole family at every Italian sausage meal. If you’ve only tried one type of Premio Italian sausage before, this combo pack is a great way to introduce yourself to some amazing new Italian sausage tastes! Use our store locator to find where our combo pack is sold near you!